Please use the print facility on your browser tool bar to print out a copy of this form. Send it to: BTO, The Nunnery, Thetford, Norfolk, IP24 2PU when you have completed it. I want the British Trust for Ornithology to reclaim Gift Aid on this and all eligible payments I make, or have made within the last four years. If there are any changes to the amount, date or frequency of your Direct Debit BTO will notify you 10 working days in advance of your account being debited or as otherwise agreed. If you request BTO to collect a payment, confirmation of the amount and date will be given to you at the time of the request. 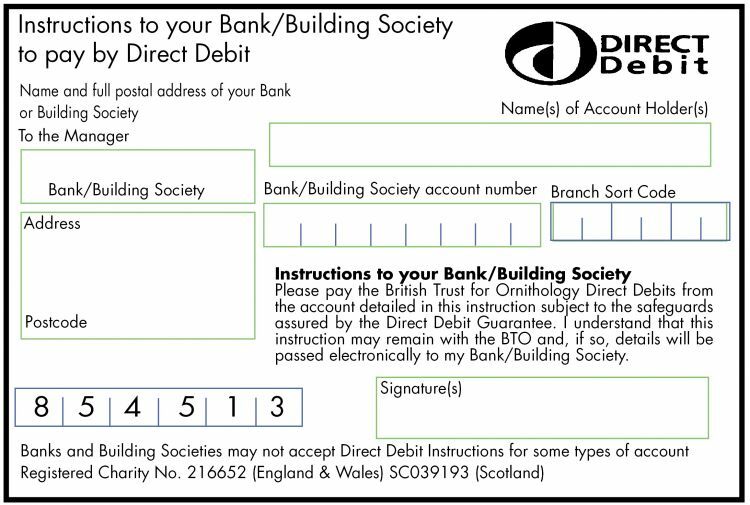 If an error is made in the payment of your Direct Debit by BTO or your bank or building society you are entitled to a full and immediate refund of the amount paid from your bank or building society. If you receive a refund you are not entitled to, you must pay it back when BTO asks you to. Members' Liability. Under the Memorandum of Association of the Trust, members are required to undertake to contribute to the assets of the Trust in the event if its being wound up while they are members, or within one year after they cease to be members, for paymant of the liabilities of the Trust contracted while they were still members and of the costs, charges and expenses of winding up such an amount as they may be required, but not exceeding £1 each. The Data Controller is the Director of Services of the British Trust for Ornithology, The Nunnery, Thetford, IP24 2PU. 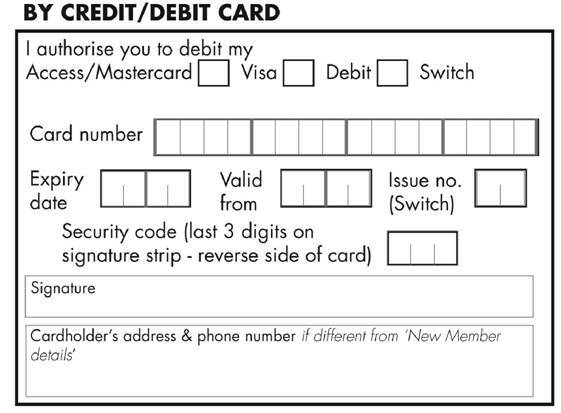 The personal information on this form will be kept on a computerised database for administration of the membership, BTO fundraising and furthering the BTO's objectives.